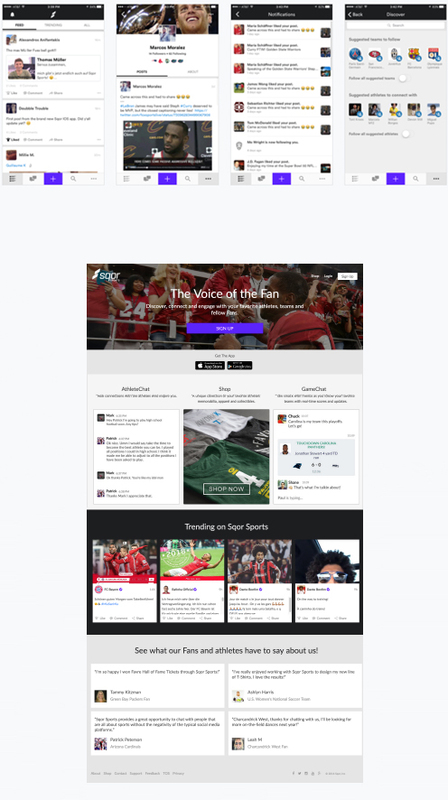 Sqor is a social media and editorial technology platform exclusively for sports, athletes, and fans. Sqor has created an entirely new paradigm in digital sports by giving elite athletes and brands the power to monetize their social presence. When I first joined Sqor I was tasked with enhancing the native app experience. 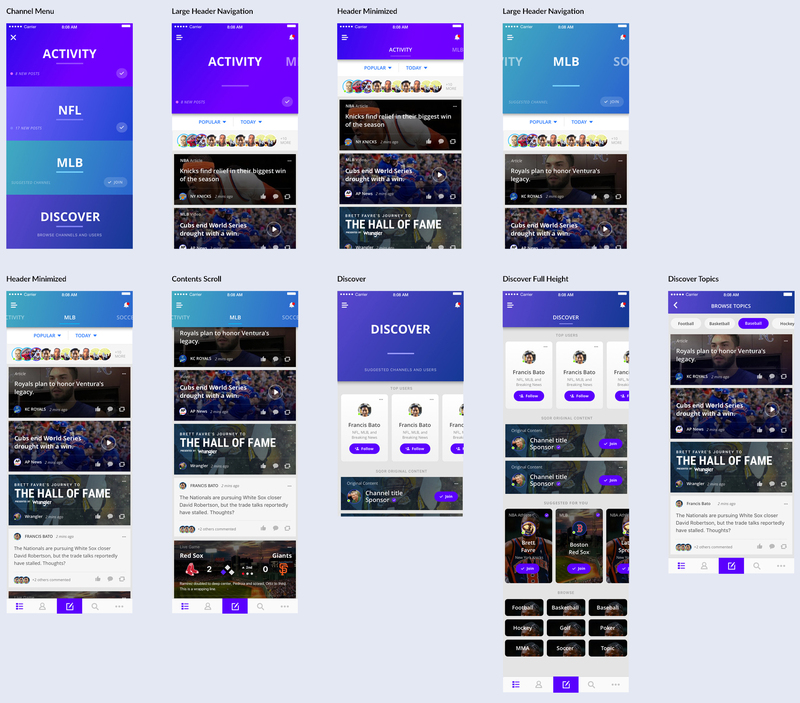 These enhancements included designing the GameCenter feature, improving the GameChat experience, and other enhancements to the initial version of the app. When it was clear the updates had little effect on retention, I began research that concluded by Implementing a new product and design strategy that aligned multiple visions from stakeholders in order to ultimately find product market fit within the sports vertical. 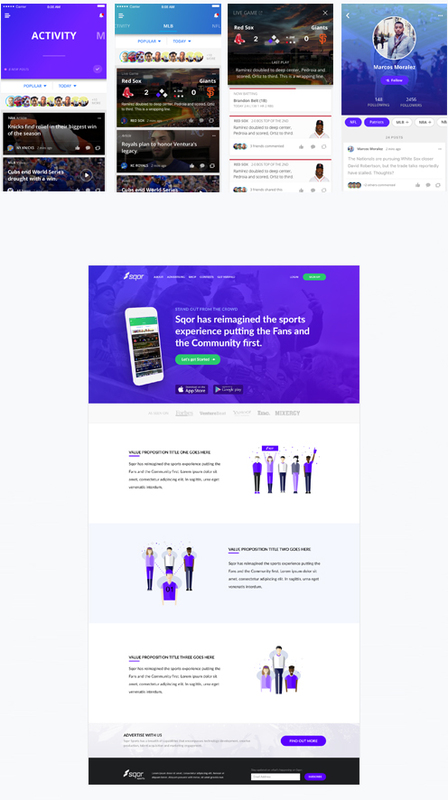 Sqor’s mission was to become the largest social network for sports by connecting fans with Teams, Athletes, and like-minded fans. Unfortunately, even as usage amongst popular athletes increased within the app, there wasn't much that differentiated us in value from companies serving the same industry and our retention suffered as a consequence. If it were 5-10 years ago it would have been easy to win users over by creating a better designed more intuitive experience than our competitors. Unfortunately for us, that is no longer the case. In fact, ESPN CBS and Yahoo sports all have a great native and web experiences. Currently, the most popular sports apps provide a wealth of information and data to users. It was clear to me that we would not be able to compete with them at that level; going head-to-head against Facebook and Twitter on the social side, and ESPN, CBS, and Yahoo on the sports side. We needed a new approach to product market fit. This case study illustrates the challenge, process, and design assets that came from the exploration. 1. It must maintain the social network aspect of Sqor. 2. 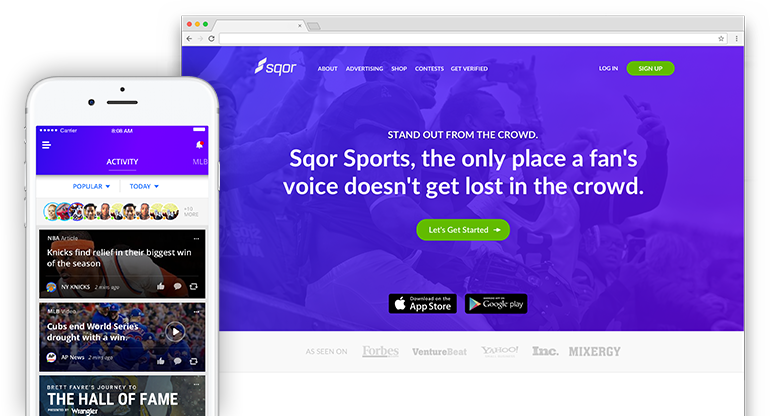 It must maintain the ability to be a revenue stream for teams and athletes via Sqor’s sponsored original content, goods, and events. 3. Must maintain the verified Team, Athlete, and Fan dynamic. To find a new approach to serve sports fans, I ran and moderated a design sprint. The goal was to create an engaging sports product that filled an unmet or underserved need in a way that could also differentiate us from competitors. During the sprint, I incorporated the teachings of Clayton Christensen. Specifically, his “Jobs to be done” framework. In it, he makes the case that people are hiring a product to do a specific job. By Uncovering that Job you are able to understand their need in its essence and meet it with an entirely new perspective. After listing user needs of current sports apps and how the job has been satisfied in different variations throughout time. We then segmented user needs, grouping people who believe the same needs are important. Then by unmet needs, those who are not satisfied with their ability to meet those needs today to uncover the “Job” to be done in sports. 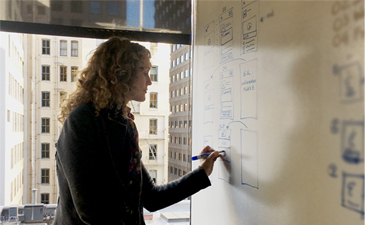 By finding the essence of the Job to be done, we were able to brainstorm new approaches for delivering a 10x experience with clear user value. Facebook and SnapChat are a great example of this. Both companies are hired to do the same job, the ability to “share a moment”, What differs is their approach and delivery of that experience. This is how SnapChat is able to compete for market share; by not providing identical features but having a different approach to the act of “capturing and sharing a moment”. The underlying “job” to be done can vary widely across sports fans. Varying Jobs include being a part of something bigger than yourself, a way to pass time, being entertained, a form of competition, and also establishing common ground. However, the essence of the job we are competing for is an encompassing one - "to be informed". Viewing the now defined job in this new light we were able to see where current apps fail. Potentially providing us with a window of opportunity to gain momentum with a product solving those needs. The areas they fell short were in community, -redacted- and -redacted-. "If you execute well against the most underserved needs, you become a threat to the incumbents. When you move on to serve the whole job (or even multiple jobs) better, you can disrupt them and be on your way to building a lasting business." After analyzing current implementations serving the job to be done and possible approaches we found a gap within the industry that utilizes community as a focal point of inbound and outbound content distribution. Ultimately, this approach minimizes the direct competition for market share instead presents Sqor as a companion app. Check out a video of the interactive prototype below. The new experience included several tools and features to promote high-quality engagement. Post primers within the app are used to seed conversations, as a means to move the user from content consumer to content creator. 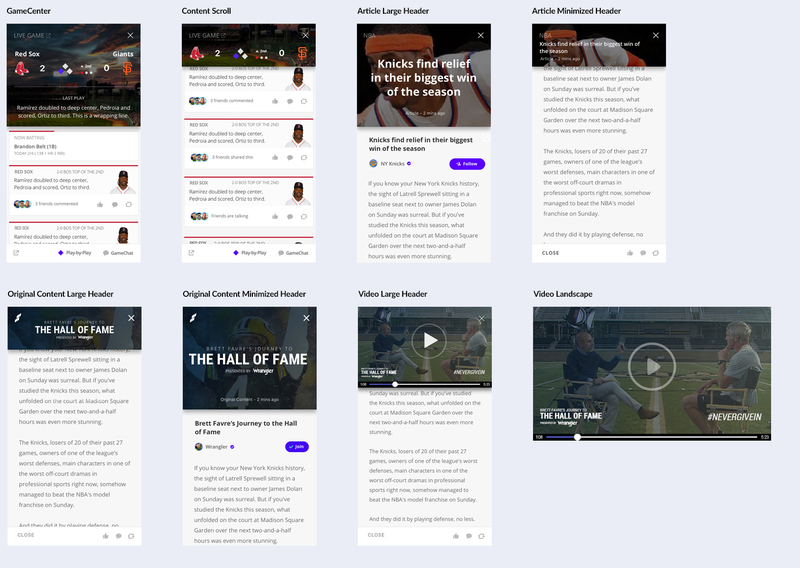 Content Chat adds a contextual element to conversations taking place on video, articles and game content. During live games, GameChat's share functionality adds a time stamp with a game clock and last play for context on comments shared outside the app. Improved navigation; hierarchy, header and primary menu. Added the use of subtle animations to create a polished experience. Updated transitions help to create an experience that is perceived as fast and light weight. 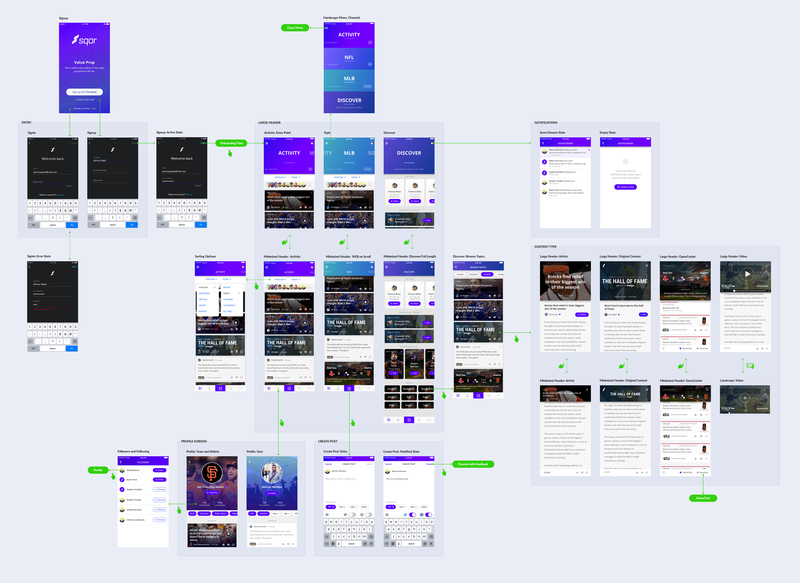 Introduced a card model presentation; allowing us to visually separate each form of content also visually appealing to our audience. Card model provides an easy way to promote Sqor's original content without resembling a paid advertisement. Added social proof of activity in channels by displaying the top users online, removing the "empty hallway effect". Users want to know their friends or fans with the same interests are also online; promotes conversation. Improved onboarding experience by removing unnecessary steps and condensing the steps into the app. Encourages exploration, we want the user to dive deep to see the depth and value of the content.